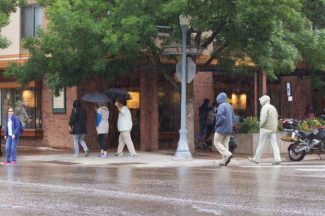 Pedestrians walk through the soaked streets of Aspen in 2016. The outlook for monsoon moisture isn’t looking good for the next 10 days because the current high-pressure pattern is doing exactly the opposite of what is needed to bring the summer rains, according to a National Weather Service meteorologist. Still, Tom Renwick in Grand Junction said Monday he doesn’t consider the monsoons late yet. On the plus side, however, the Service’s updated outlook for this winter is now predicting a 70 percent chance of an El Nino winter in 2018-19 for the Northern Hemisphere, according to an El Nino watch posted online July 12. Still, the immediate concern in the Roaring Fork Valley is the Lake Christine Fire and when rain relief might be on the way. And unfortunately the news Monday was not good. “The high (pressure) is going in the completely wrong direction,” Renwick said. Colorado’s monsoon storms originate in Mexico’s Sierra Madre mountain range and the Gulf of California. For those storms to be pulled north, the ridge of high pressure currently over Colorado must move over Texas and Oklahoma, Renwick said. But instead of moving east, the high pressure is moving west, Renwick said. That is forcing the monsoon storms west. “The moisture we should be getting is in Arizona and Utah,” he said. The smaller storms — with dry lightning and some rain — seen lately in the Aspen area and other parts of the Roaring Fork Valley is moisture that forms in the atmosphere during the day, a weather pattern more akin to “pop and drop” storms in June, Renwick said. By the end of next week, a low-pressure system may move in from the Pacific Northwest and possibly help shift the high pressure east, he said. “There is hope,” Renwick said. Monsoons generally start in Colorado in mid- to late July, he said. An attempt Monday to reach the incident meteorologist for the Lake Christine Fire was not successful. So far, the Colorado monsoon forecast from the National Weather Service’s Climate Prediction Center isn’t turning out as predicted. In June, the CPC predicted the summer months in Western Colorado had a 40 percent to 50 percent chance of above-average precipitation and early monsoons. And while that may not exactly inspire confidence in the Center’s weather prediction prowess, the agency is increasing its prediction of an upcoming El Nino winter, which stood at about 50 percent in June. On July 12, the CPC — which includes analysis from the National Oceanic and Atmospheric Administration — said the chances of an El Nino year should increase to 65 percent this fall and to 70 percent for winter 2018-2019, according to an analysis on the CPC website. El Nino occurs when Pacific Ocean temperatures warm and the jet stream drops south, allowing snow storms to move farther south, as well. The weather phenomenon generally produces increased snow years in the mid-to-southern areas of the West and decreased snow in northern areas.